The Oxton film club, The Projection House, are pleased to announce details of a couple of upcoming events. 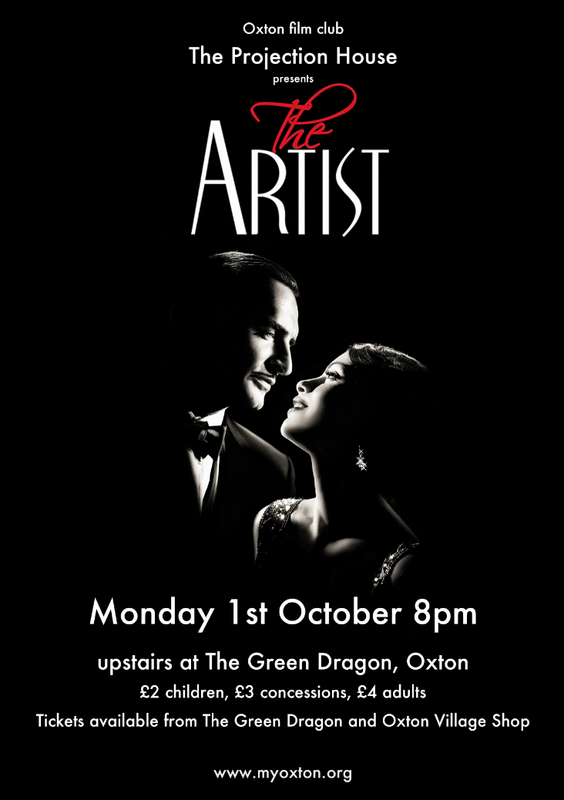 Firstly, in a departure from previous offerings, we are teaming up with The Green Dragon in Oxton to screen the Oscar winning film THE ARTIST at 8.00 pm on Monday 1st October. The showing will be in the Dragon’s upstairs room, using our new large screen and new projector. Tickets are available from the Green Dragon and the Post Office, at the usual £2 for children, £3 for concessions and £4 for adults. Refreshments will be available. It is hoped that, with your support, this will be the first of many such film nights in the pub! Meanwhile, Saturday 27th October will be horror night, with a spooky family film at 5pm, followed by a late night adult chiller at 10pm. In between the two films there will be a Halloween Ball with food, drink, games, music, and prizes for the best dressed ghouls. Full details of the evening will be announced in September.